I was 100% guilted into making this cake. That is the complete truth. You see, I have this friend who is a major chocoholic, probably even more so than I am. I posted an oatmeal cake a few weeks ago and he told me it was criminal to post any desserts that were non-chocolate. After that, he commented on an Instagram post of a piece of chocolate cake reminding me and his wife “what chocolate looks like.” So naturally I was feeling guilty and I made this cake. I could say it doesn’t take much to”guilt” me into something, but I think it’s really just more that I love making things for people. I’m always finding reasons for why this person needs cookies or why I’d better make this family some bread, etc. I think I get it from my grandma. She was always doing things for others. This cake pretty fabulous! 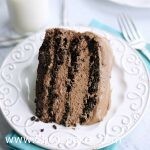 Layers of moist chocolate cake and amazing chocolate mousse, topped off with the frosting from my mississippi mud cake. . . oh it’s definitely a chocolate lover’s dream and could easily put anyone into a chocolate coma. It’s definitely rich, so a little piece goes a long way. Hey Eric, thanks for making me feel guilty :)! Keep those comments coming! Whisk together sugar, flour, cocoa, baking powder, baking soda and salt in large bowl. Add eggs, milk, oil and vanilla; beat on medium speed of mixer 2 minutes. Stir in boiling water (batter will be thin). Pour batter into prepared pans. 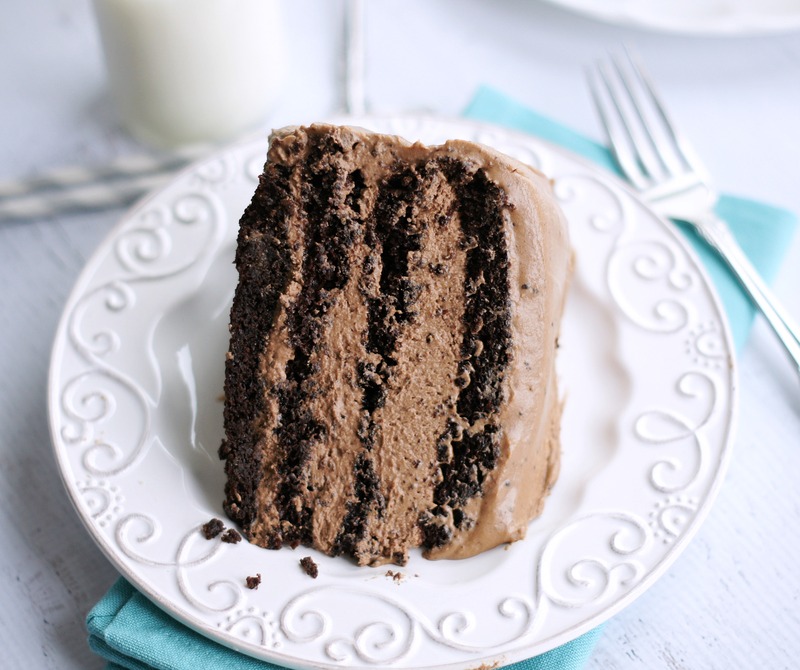 Once cakes have cooled, use a sharp serrated knife to cut each cake evenly in half, horizontally, so you end up with four cake layers. 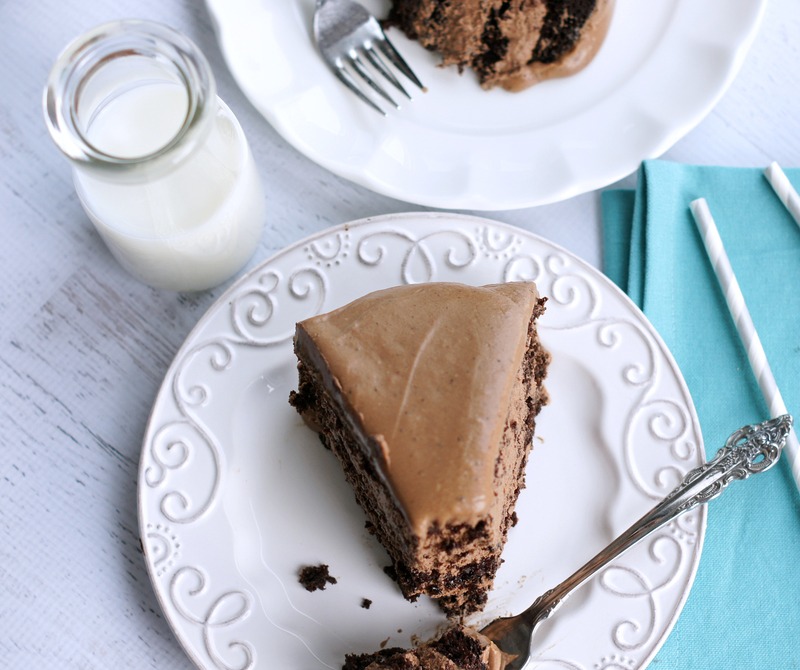 Place your first cake layer on a serving plate. Spread about a 1/4 of the of mousse filling on top of that cake layer. Repeat with the remaining cake layers, adding a layer of mousse filling between each layer of cake. Spread the last 1/4 of the mousse filling, evenly around the entire outside and top of the cake. Refrigerate for about 15-20 minutes. To make the mousse filling dissolve the cocoa in the hot water. In a microwave-safe bowl melt the chocolate chips by cooking for 1 minute on high, stir and continue cooking in 30 second increments at 50% power until chocolate chips are melted and can be stirred smooth. Add cocoa mixture to the melted chocolate chips and stir well to combine. In a separate bowl, beat the heavy cream and sugar until stiff peaks form. Add the whipped cream mixture to the melted chocolate and fold in with a spatula until well combined. Refrigerate until ready to use. To make frosting, melt butter in a medium saucepan over low heat. Whisk in milk, vanilla, and cocoa, whisk until smooth. Remove from heat and stir in powdered sugar and pinch of salt. Continue stirring until smooth and pourable. Pour over cake. 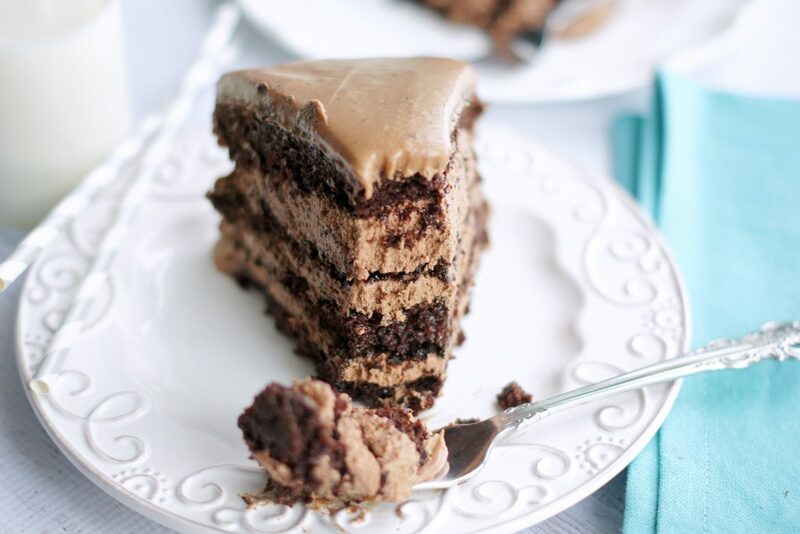 Use a spatula or knife to evenly and gently spread the frosting over the outside of the cake as you pour. I love chocolate mousse so much. This looks so fabulous, Jodi. I will have to try this soon. Thanks for a yummy recipe! Wow! Melt in your mouth. HE had it for breakfast the next morning (as well as dessert) – then the kids finished it off after school. THANKS! Glad you guys enjoyed Lara! Superb cake, Jodi! Thank you for making it and sharing it. Who is this Eric character anyway?? Emma and I made this cake today. It was superb. Lara tried to foil our plans but we persevered and made it anyway. Eric, I am completely impressed at your baking skills. You may just be the next Betty Crocker. Tell Lara to stop it :)!